Last weekend, I checked the 15 Eastern Bluebird nesting boxes at Merrimac Farm Wildlife Management Area (WMA), which is something I volunteered to do last year, and I am doing again this year. It was the first time that I checked the nesting boxes this year. In the 1960s, the population of Eastern Bluebirds declined to a level raising fears of extinction. However, through volunteer intervention and the use of Bluebird nesting boxes, the Eastern Bluebird is now doing well. As a volunteer, about once a month during the spring and summer, I take turns with other volunteers checking the nesting boxes. Checking the nesting boxes entails inspecting the contents of each nesting box for activity and recording findings in a log, cleaning out old nests and other debris such as wasp nests or nests of other birds, and identifying any nesting boxes in need of repair. Merrimac Farm WMA consists of 300 acres, and the 15 Bluebird boxes are spread from one end of the wildlife area to the other. It takes a couple of hours or more to locate and inspect the nesting boxes, but it is very rewarding for many reasons to include just being outdoors in a natural environment with open fields and heavily wooded areas where other wildlife can be seen (and photographed). I found more than half of the nesting boxes had some form of ongoing activity. However, there was one nesting box occupied by Chickadees. That box with a Chickadee at its entrance can be seen in the opening image (above). 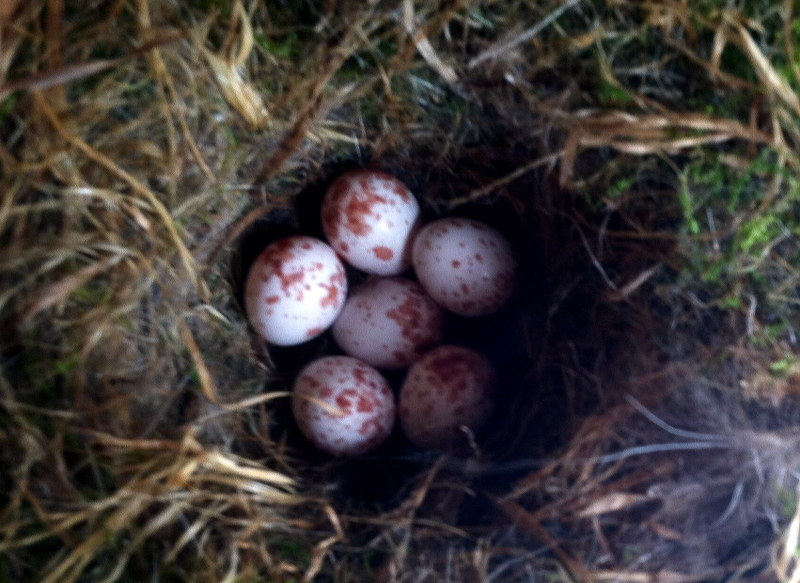 When I opened the box to check its contents, I found 6 Chickadee eggs (below–this photo and the others that follow were taken with my iPhone). The Chickadee, as well as the Bluebirds that I saw, while checking their boxes, kept a close eye on me and were glad to see me leave. By the way, we do not remove Chickadee nests from the Bluebird boxes. 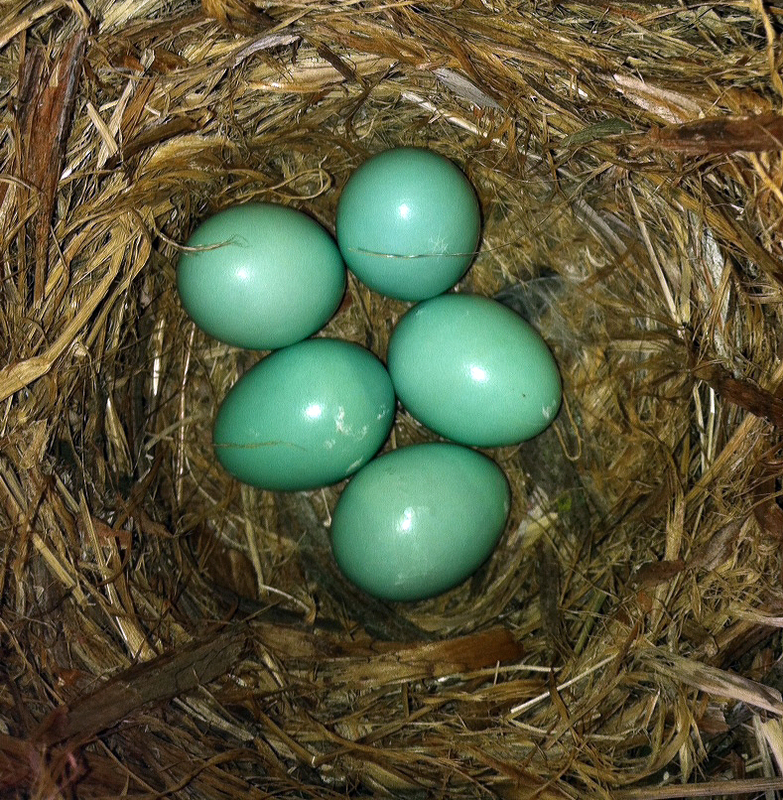 Below is a photo of one of the boxes containing Bluebird eggs. You can easily see the difference in size and color from those of the Chickadee. 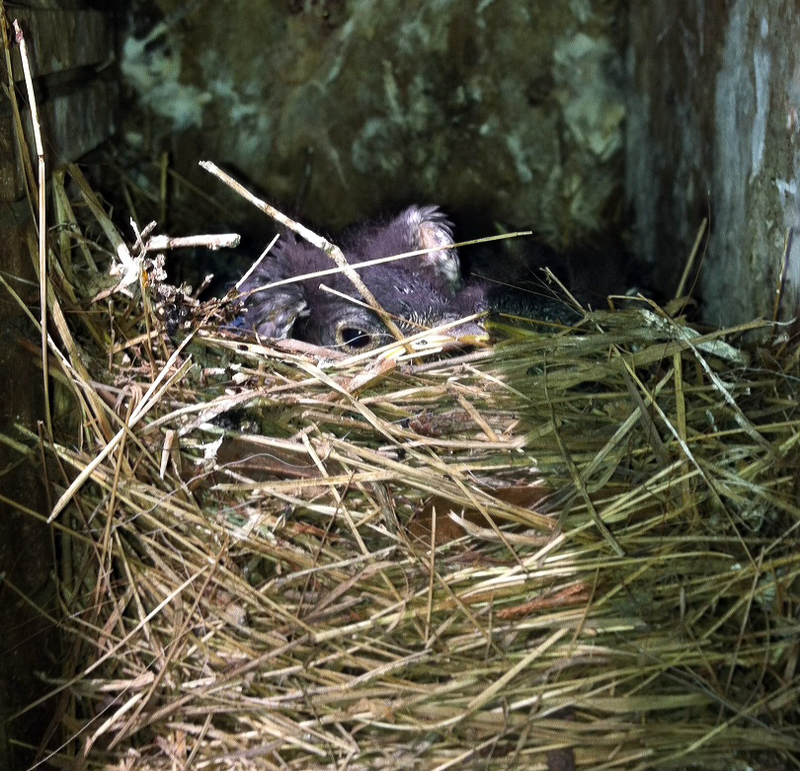 In most instances, when the nesting box is opened, it is not possible to see if the nest is occupied because of the height of the box from the ground. In order to see into the nest, I use my iPhone camera; however, most other volunteers use a mirror. Below is one of the nests after the box was opened. In the next photo, you can see a young bird’s eye looking at me after I opened the nesting box. Therefore, I quickly closed the box. As you can see, it is important to document the status of each nest and its contents so the next volunteer does not open a box with young birds that are about to fledge, thereby causing them to leave the nest too soon. Unfortunately, the volunteer program at Merrimac started late this year; therefore, I was documenting the status of the nests for the first time. 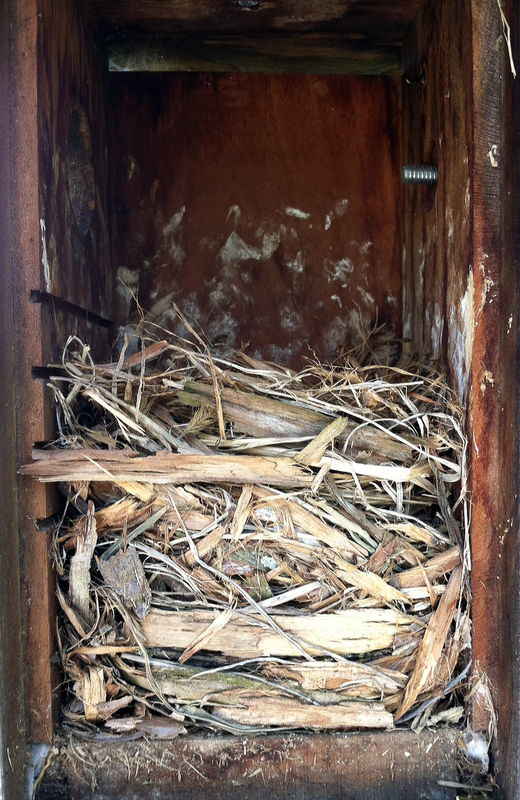 Otherwise, this nesting box should not have been opened until after the fledglings had left the nest. The next two images are of other nests containing very young Bluebirds. 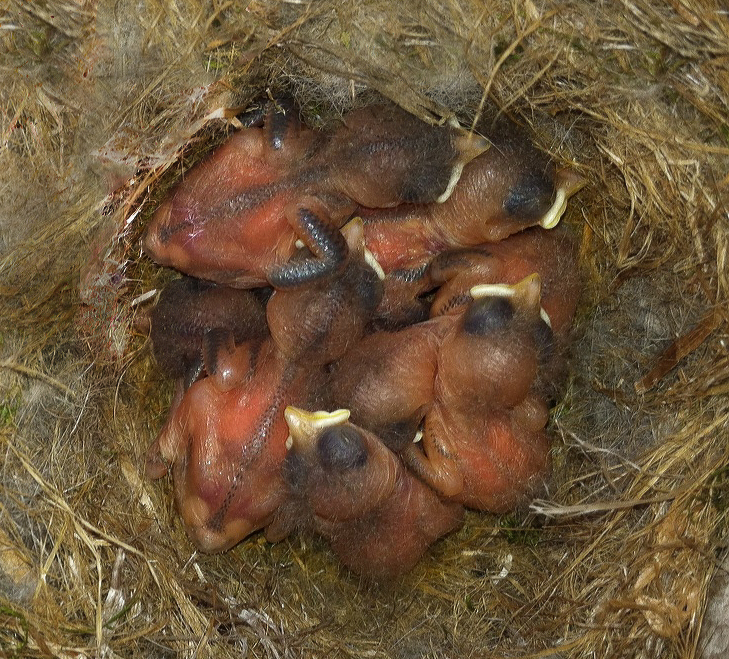 The first image shows Bluebirds less than one week old that are naked of any feathers. In the second photo, the young Bluebirds are more than one week old, and their feathers are beginning to grow. Bluebirds leave the nest between 17-21 days after hatching. The nesting boxes are cleaned out after the fledglings leave the nest. Eastern Bluebirds often have two broods of young each year. Bluebirds normally eat a wide variety of insects, but during the winter months, when there are no insects, Bluebirds that do not migrate will often feed at bird feeders. We have two pairs of Bluebirds that come to our feeder during the winter months. 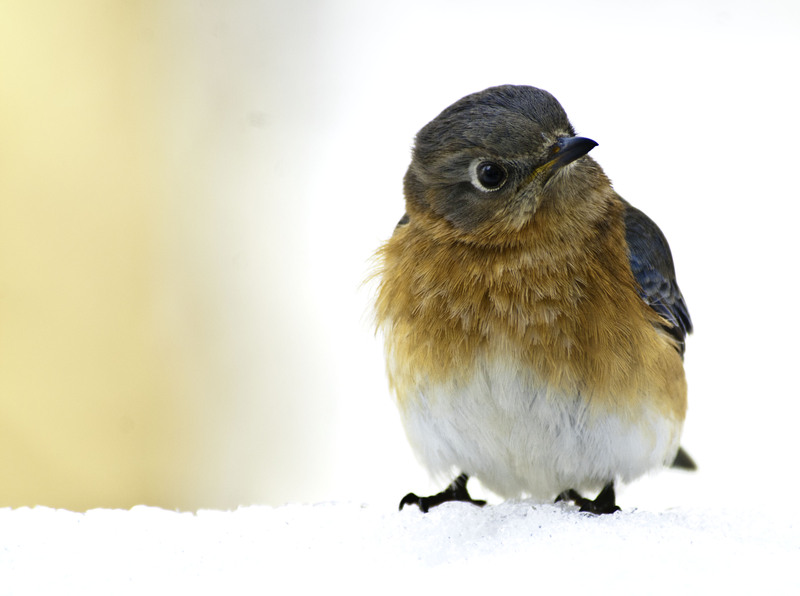 Below is a photo I took of a Bluebird standing in the snow last winter after visiting out feeder. 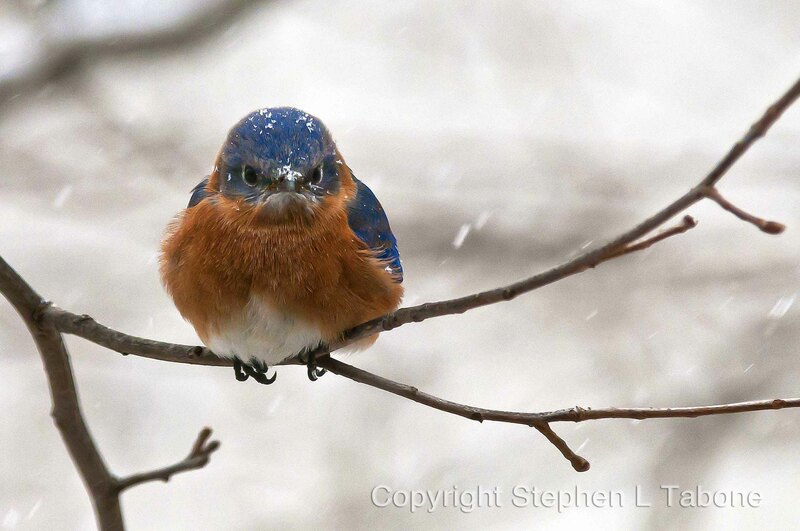 And, below is a photo that I took of another Eastern Bluebird two winters ago that was not enjoying the snowfall. The Bluebird certainly did not look happy. I will be checking the Merrimac Farm WMA Bluebird boxes several more times throughout this spring and summer, and if I see anything interesting and can photograph it, I will post it to my blog. 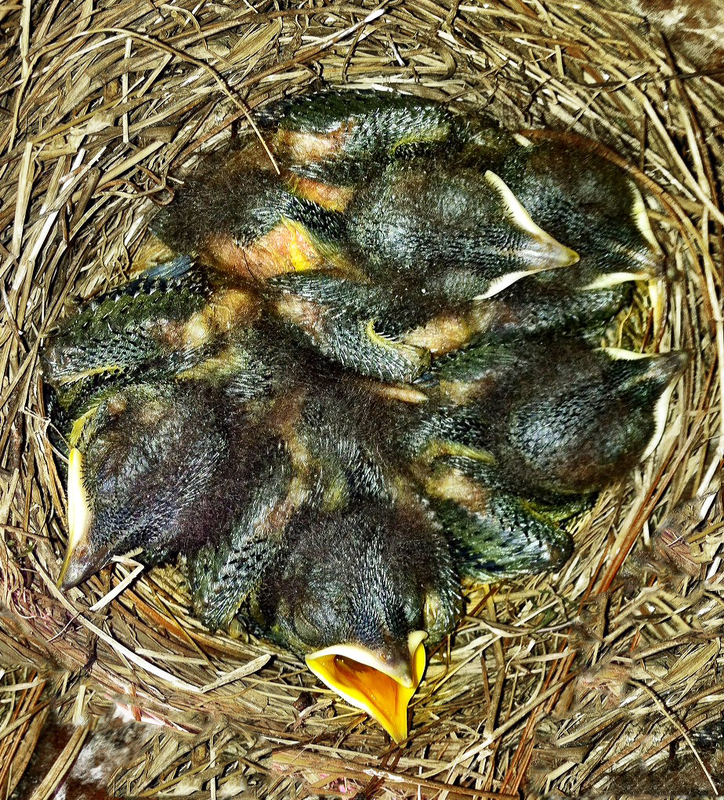 This entry was posted in Bird Photographs, Merrimac Farm Wildlife management Area, Nature, Wildlife and tagged bluebird boxes, bluebird eggs, bluebird nesting boxes, Bluebirds, eastern bluebirds, nature, wildlife management area. Bookmark the permalink. Bluebirds are fun to watch. We’ve had a pair nesting in a box at the back edge of our yard every spring for 5 or 6 years now. We try not to bother them by opening the box too often. One year we did open it to get photos a short time before they fledged. The first year, our box wasn’t quite right — my husband found out they needed wire on the inside to climb out, added it, walked away and like pellets from a slingshot, they flew out of the nest as he walked away! One supper, we had a pair that raised 3 broods — was a good year for insects,! Last year, only one nesting. Great job on helping keep track of the boxes. It’s great to see the photos. Patience and persistence pays off; however, there must be a photographer who has the expertise to capture these images as they emerge….great work Stephen. I loved seeing the birds in their various stages. Thanks for sharing! And thank you for keeping up with my blog. A wire mesh in the front of bird boxes helps to prevent predators (e.g., raccoons, larger birds) from entering or reaching into the box.